A black and white photograph of Robert McNee (1890-1962). Robert McNee was born at Dunbarton, Scotland on May 12, 1890 and came to Whitby about 1918 as a wounded soldier who was stationed at the Military Convalescent Hospital. According to the Oshawa Times from September 19, 1962, Robert McNee was senior clerk at the Ontario Hospital for 35 years and was a member of St. Andrew's Presbyterian Church where he served as a church elder for many years. He was a past master of Composite Lodge, No. 30 AF and AM and a past principal of Keystone Chapter, RAM No. 35. He was overseas during the First World War with the first division of the Third Battalion of the Toronto Regiment and was wounded in action in 1917. From 1920 to 1955 he was a clerk at the Ontario Hospital at Whitby. He was president of the Royal Canadian Legion Branch 112, Whitby in 1927, the year it was chartered. 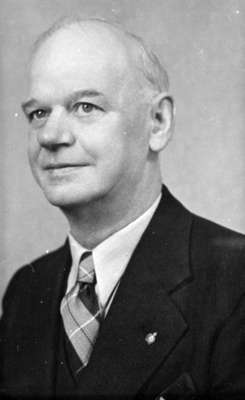 Mr. McNee was a member of the Town Council from 1941 to 1953 and Reeve in 1945. He died at Oshawa on September 19, 1962 and is buried in St. John's Anglican Cemetery, Port Whitby. Robert McNee, 1937, Marjorie Ruddy. Whitby Archives 31-009-467.